Glass cutting typically involves scoring the glass, and then applying pressure to either side of the score. It’s fairly easy when the glass is flat, but cutting around the circumference of a bottle presents a couple of roadblocks. First, the score has to be straight. Second, there’s no way to uniformly apply pressure to both sides of the score. Building a simple roller guide solves the first problem, and harnessing some simple physics solves the second. 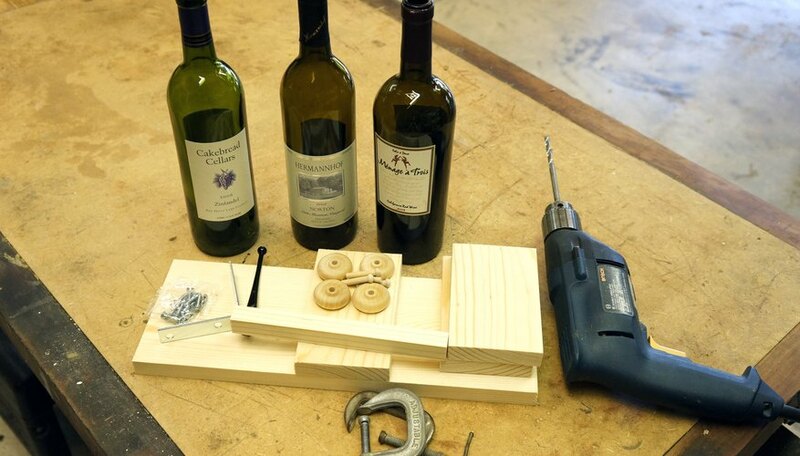 Cutting bottles starts with building a simple scoring jig from scrap lumber and toy wheels. Please see the last slide for an itemized list of tools and materials. 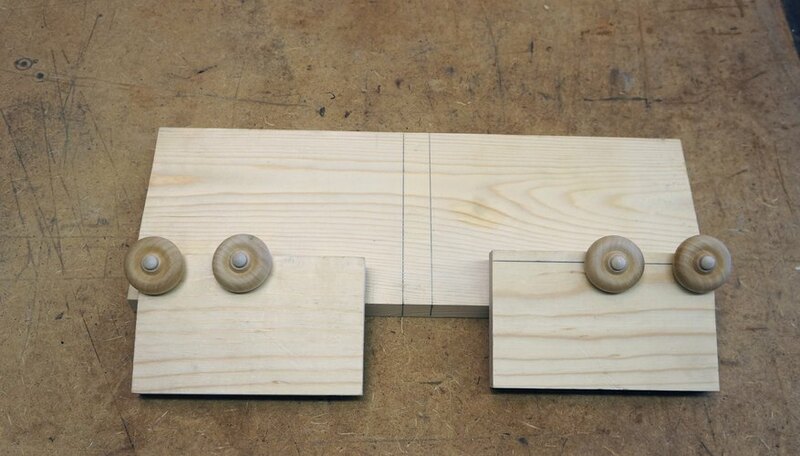 Make the wheel boards: Mark lines on two of the 1 by 4s, 1/4 inch from one long edge. Mark points 3/8 inch and 2-1/2 inches from the left end of one board and from the right end of the other. Drill a 1/4 inch hole at each mark. Slide an axle through each wheel. 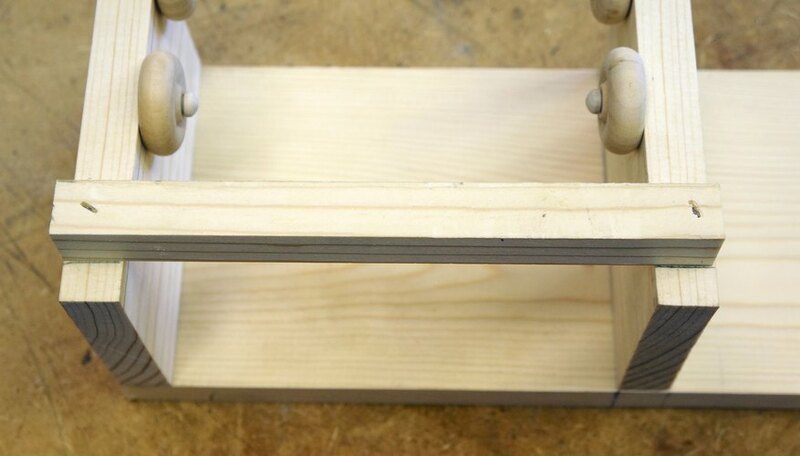 Put a small dab of wood glue on the end of each axle and press one into each hole. Make sure the wheels spin freely, then let the glue dry for an hour. Assemble the jig: Mark lines at 7 1/4 inches and 8 inches from the left end of the 1 by 6. Nail one of the wheel boards flush with the left end of the 1 by 6, with the wheels facing in. Nail the other wheel board centered between the marked lines, with the wheels facing in. Nail the 1 by 1 to the two wheel boards, 1/2 inch from the edge. 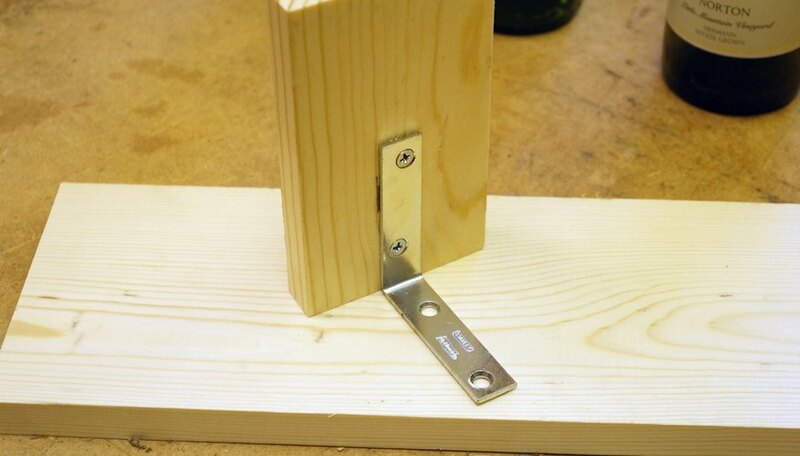 Create an end stop: Screw the L bracket to the face of the third 1 by 4. Position the bracket so it’s centered on the width and flush with one end. 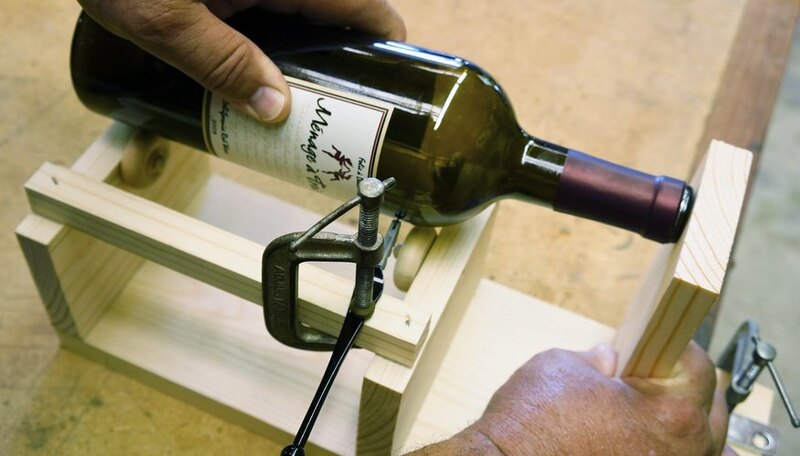 Set a bottle over the wheels, and then clamp the end stop at the opening of the bottle, using a C clamp. Clamp the glass cutter to the 1 by 1, using another C clamp. Position the cutter so it just touches the bottle but doesn’t lift the bottle off the wheels. 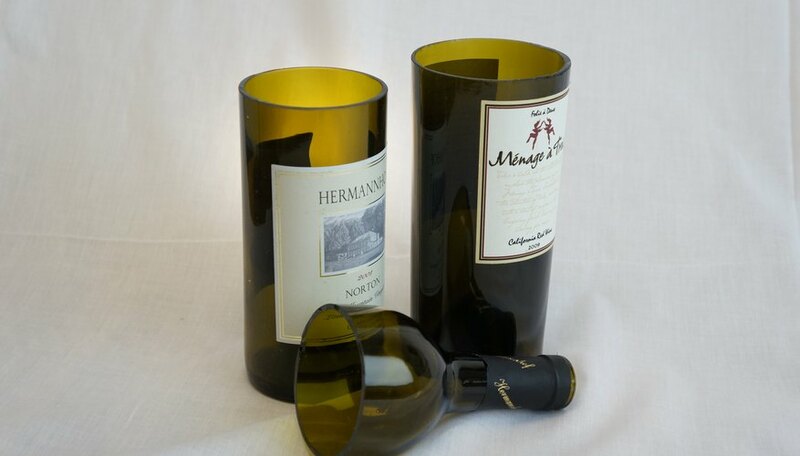 Press the bottle forward toward the stop and spin it slowly in the wheels, scoring around the bottle with the glass cutter. Strive to create an uninterrupted score and avoid going around the bottle more than once. Multiple scoring lines lead to more failures than a faint score line. Heat a kettle of water to boiling. 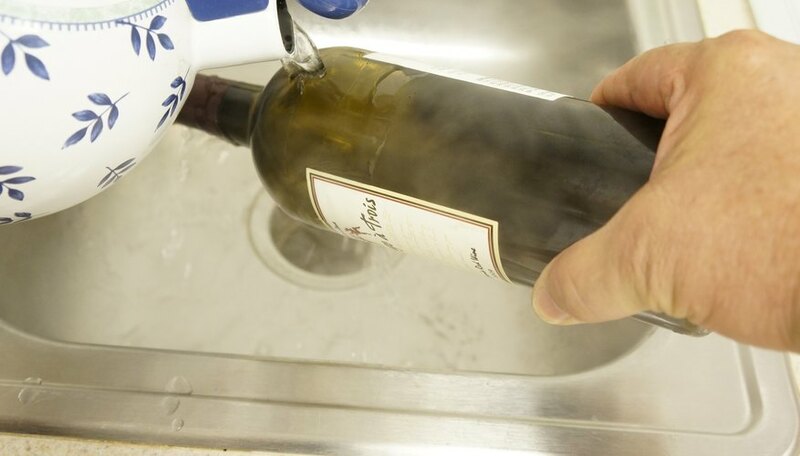 Put on your safety glasses and pour the hot water over the score line, holding the bottle by the bottom and tilting it so the water flows away from your fingers. 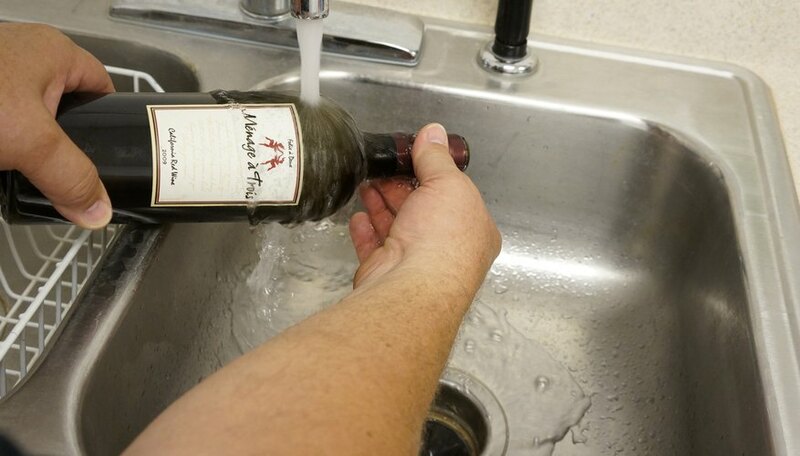 When you feel the bottle begin to warm up, place the score line under cold running water. The thermal shock will cause the bottle to separate at the score line. It may take a few repetitions of the heat and cool cycle to complete the cut. Place a quarter sheet of wet/dry sandpaper on a ceramic tile. Liberally douse the sandpaper with water. 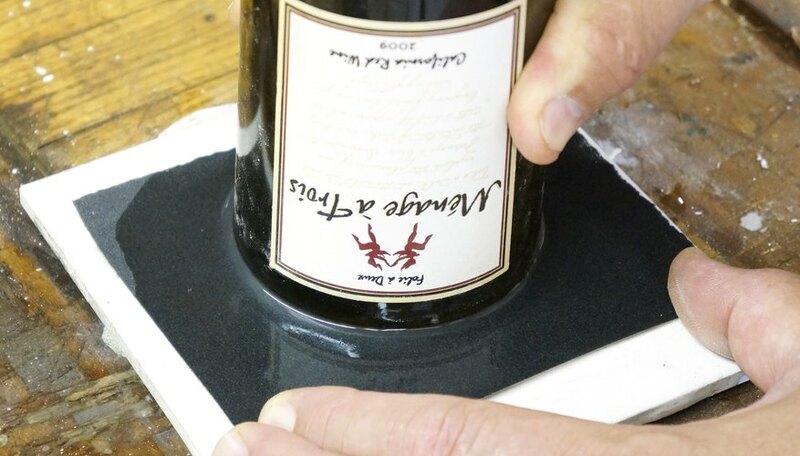 Place the cut edge of the bottle on the tile and slide it back and forth across the paper. This will sand down the edge of the cut to be level and flat. Bevel the edge inside and out with a piece of wet/dry sandpaper on a sanding block. Keep the paper and the glass wet while working, dipping the sanding block in a bucket of water frequently. 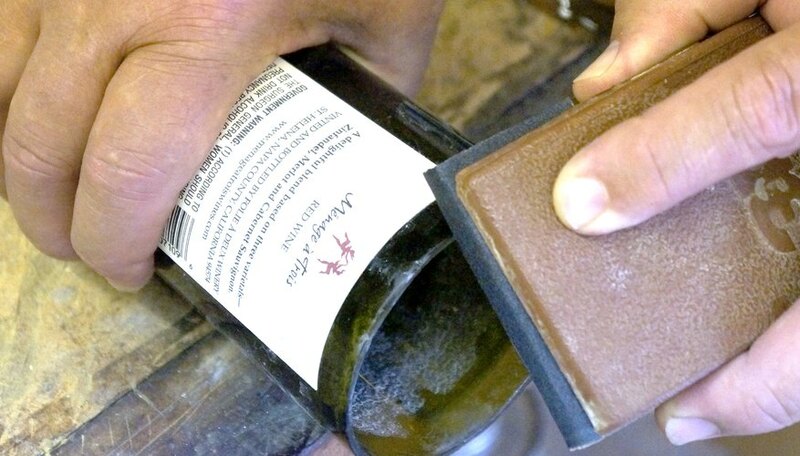 Wet/dry sandpaper and rubber sanding blocks are available from auto paint suppliers as well as many home centers. If your score isn't complete, the bottle may fracture in an unexpected way. Gloves may protect you from cuts while shocking the bottle, but they may not grip as securely as your fingers. If you wear them, maintain a firm grip on the bottle.